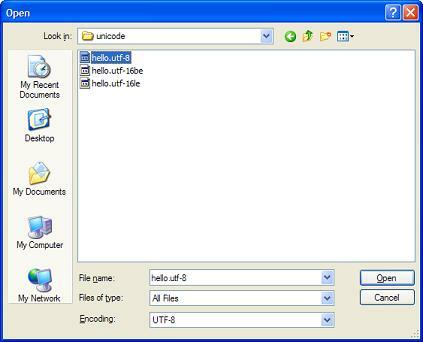 This section provides a tutorial example on how to open a UTF-8 text file with Nodepad correctly by selecting the UTF-8 encoding option on the open file dialog box. According to the Notepad help information, Notepad support 3 Unicode encodings: Unicode, UTF-8, and big-endian Unicode. Let's try to use Notepad to open the UTF-8 text file, hello.utf-8, created from the previous chapter first. 1. Run Notepad and click menu File > Open. The open file dialog box comes up. Very nice. This proves that Notepad can open UTF-8 text file correctly if the UTF-8 encoding option is selected. If you select a different encoding, like Unicode, the UTF-8 text file will be opened incorrectly. Try it out yourself.